I’ve been planning to experiment with homemade grenadine for some time, in an effort to avoid the mysterious sweet red mixture that is Rose’s. Corn syrup and food dye have no business showing up in my drinks. Grenadine was originally made with pomegranates, and its purpose was to add color and acidity to beverages. Over the years it has transformed into a bright, sugary syrup that lacks the slightest trace of pomegranate juice. I tried a couple of different combinations, including a cherry-based “grenadine” because sometimes I forget that I just can’t stand pomegranate juice. Here they are in order of least to greatest success. For my initial attempt at homemade grenadine, I decided to use pomegranate seeds rather than juice. The fruit is in season right now, and I had a handful of them hanging around the house from my last community farm box. This was my first experience with fresh pomegranates, and I really didn’t know what to expect when digging into one. To make a long story short, I butchered the pomegranate in a manner that evoked the theme music to Dexter (which is still stuck in my head at the moment). If you’re as messy as I am, put on an apron, because you’ll end up with juice on your clothes, in your eye, on the kitchen rug, and possibly the cabinets. But maybe that’s just me. I scooped the seeds of one and a half medium-sized pomegranates into a small pot of simple syrup, added some lemon peel, then boiled it down. End result: excellent color, but a little weak on flavor and acidity. The adjusted recipe is below. Bring to a boil and let simmer for 30-40 minutes, or until liquid takes on desired flavor and texture. I took my not-quite-fruity-enough mixture and added pure pomegranate juice to it (1/4 cup), and then just a tiny bit of orange blossom water (2 tsp). The result of this doctoring was a sweet, tangy, and very fragrant concoction. If you’re thinking of trying the orange blossom water, just know that less is more. That stuff is mighty powerful, and to be honest, smells a lot like a cheap perfume someone’s granny might wear. The jury is still out on how I feel about this interesting ingredient, though you should know I have issues with lavender in the realm of cooking as well. Also, as a rule, I don’t trust anything the color of fish sauce. So I finally abandoned the traditional pomegranate, not being a huge fan anyway, and decided to give the cherry idea a try. I thought this yielded the best results of the three, and seems as though it might prove to be the most versatile, though it might not be the most traditional way to go. 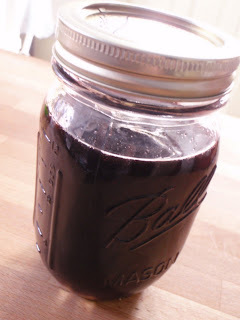 Combine cherry juice through lemon peel in a non-reactive pot and let it simmer for about 30-40 minutes. Turn off heat, add sugar and stir until dissolved. Add extra sugar if needed. Let cool, strain into a storage container and add the orange blossom water. I decided to try my new version of grenadine in a classic cocktail using one of my favorite spirits: rye. The Ward Eight, spicy and tangy, might have been a good choice for election night. It purportedly was created in 1898 in celebration of a Boston democratic candidate’s victory in being elected into office. Bar tools: shaker, juicer (optional). Fill shaker with ice, add all ingredients and shake well. Strain into a chilled martini glass. Garnish with a cherry. Optional: For improved color and a touch more sweetness, I put an extra bit of grenadine directly into the glass before filling. Check out this week's host of Mixology Monday, The Pegu Blog. I like your idea of Cherry Grenadine. I've made my pomegranate grenadine in a similar fashion. 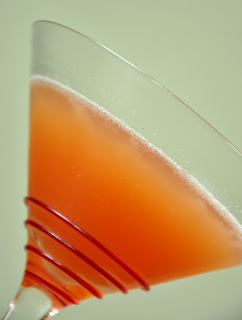 I think I'd like to try you recipe and use a bit of maraschino liqueur in it as a variation.